Hi there crafty friends – I hope you had a great Christmas 🙂 We have had a fab time here in the Steele household and we’ll be in holiday mode right up until it’s back to work/school so we’re making the most of it!! I wasn’t planning of posting between Christmas and New Year but I have some time today to share this card that I have made for my parents wedding anniversary which will be on the 4th of January. Now, normally I make more ‘traditional’ cards for my parents and probably more light-hearted one’s from my children for them, so this is something very different!!! Saying that, I know they will have a laugh at this fab image which is called Stella Love – Person to Annoy which is a digi image from Bugaboo Stamps. I’ve been meaning to have a look a good look around this store for a while and when I had some time just before Christmas I did just that and the choice is amazing! At the moment there is a sale on until the 15th of January – 50% off everything!!! I also used papers by Pebbles called ‘Yours Truly’, stickers from the same line and Spectrum Noirs to colour. Can I just point out that my dear Mum and Dad don’t look like this!!! Thought I’d better point that out incase they ever read this post! Lol! When I was looking through the stickers that I was going to use here I found the one that’s a stamp sort of shape that says ’47 in Love’. How spooky – it will be my parent’s 47th wedding anniversary – it’s like fate! Well, that’s all from me for today and probably until the New Year. Thanks so much for stopping by today and I’d like to wish you all a Very Happy, Healthy and Peaceful 2016! 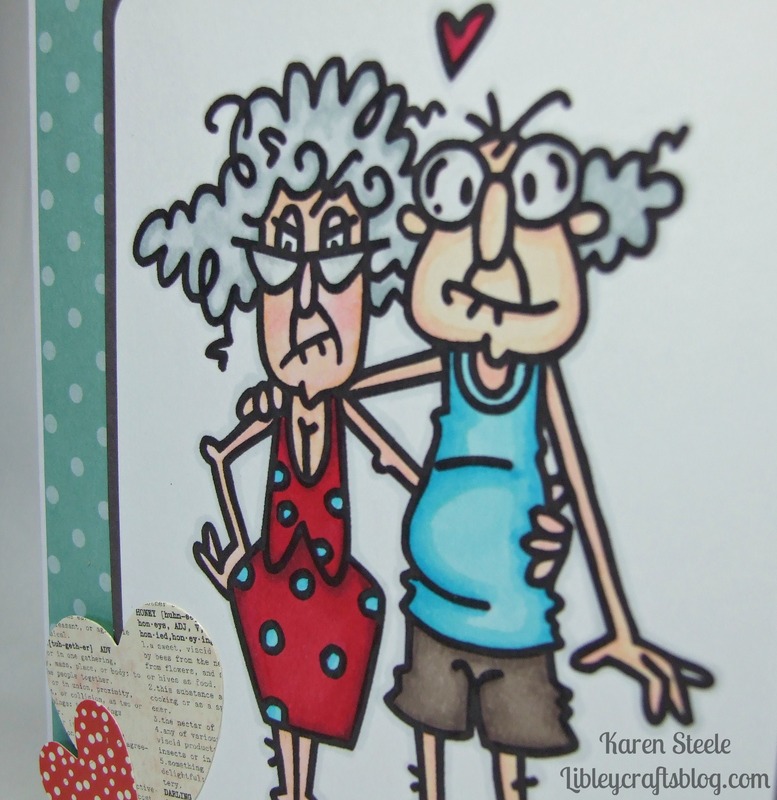 An awesome anniversary card for your parents…they’ll love it!!! 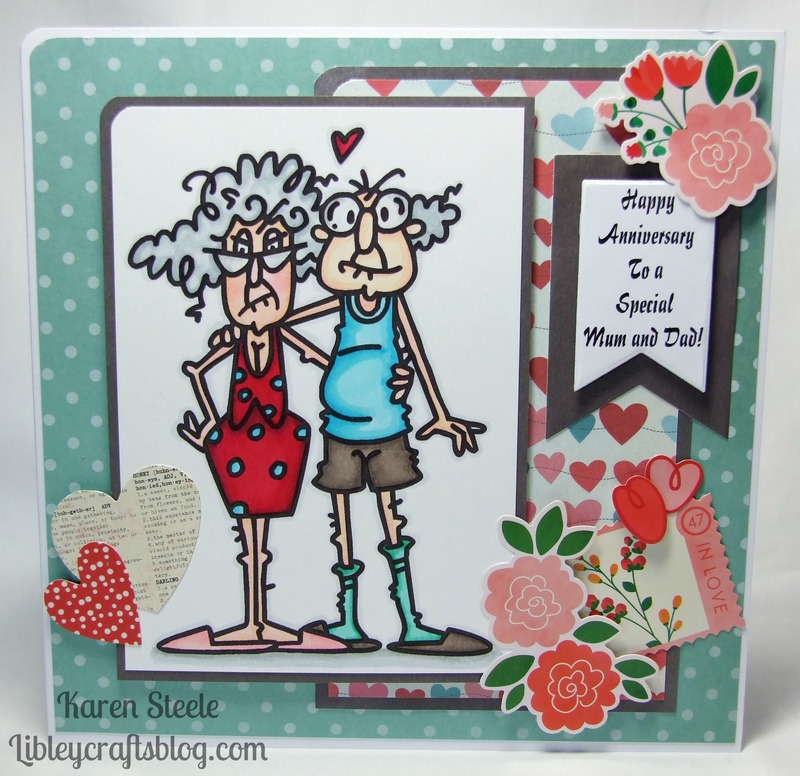 I love Stella and Gus and your card is looking romantic and fun! Thanks for joining our challenge at Catch the Bug and good luck. This is adorable, Karen. I’m sure your parents will love it! Thanks for sharing with Catch the Bug this week.